Mountain man fights local government to keep nature school natural. We have to ask where the Sierra Club is? Oh, wait, they don’t approve unless someone’s living in a cave with nothing. NASA: “We’ve discovered a previously unknown surprise circling Earth.”. For an encore will they discover something unknown circling Uranus looking for Klingons? Renewable Energy: Bringing blackouts back to California? A possible repeat of the “rolling blackouts” of early last decade only this time Enron isn’t to blame: “…the state has pushed to increase the use of solar and wind energy without ensuring that there is enough traditional power generation to keep the grid stable on cloudy, windless days.” Seems to us this sort of problem was why people switched from windmills to oil and gas in the first place. Forward. Sequester railroads Biden’s pricey plane travel. Looks to us like sequester is a GOOD thing. We do feel sorry for the passengers on AMTRACK. Perhaps Joe can explain to them how it’s like a slow bullet train or something. State health inspectors destroy 1,600 lbs of hunted deer meat donated to homeless. Yes, we know, it’s safer to have them go dumpster dive for a meal. Another logic fail from government. Want to bet some Petatard called in the complaint? Dennis Rodman: Kim Jong Un is a ‘friend for life. Not to mention dictator for life. Is Dennis related to Joe Biden or John Kerry? INDOCTRINATION? HOUSTON PUBLIC SCHOOL ASSEMBLY SLAMS BUSH AND HEAPS PRAISE ON OBAMA (UPDATE: DISTRICT APOLOGIZES). Another Texas school fail. From what we see, perhaps this school should be teaching remedial English. Multimillion-dollar homes, private planes and plastic surgery: Huge American wealth of Mexico’s top union honcho arrested for plundering $160MILLION. This is what happens when you’re a pendeja and don’t spread around the mordida to the Federales. 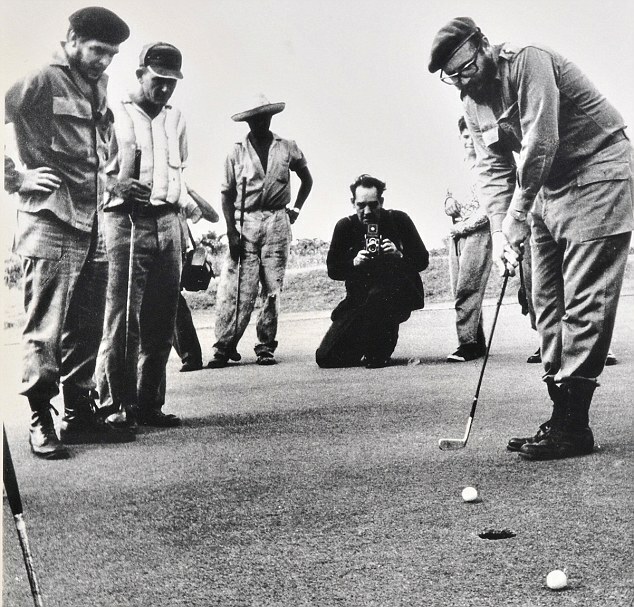 Communists who tore down a government – then went for a nice game of golf: Rare pictures Castro and Che Guevara tweaking Eisenhower’s tail. Wonder who this reminds us of? Hint, his last name starts with the letter O.
High-flying Holder: Report shows AG, FBI director used luxury jets for personal travel. You can bet these babies won’t be put out of service if Sequester happens. So has the government been reimbursed? If not, did they declare this as income and pay taxes? Oh, silly me, that’s only for the little people. Congress passes bill renewing anti-violence law. We predict this will work about as well as the gun free, drug free and child molester free zones around schools. More fluff so we think Congress is actually doing something besides feathering their own nests and getting reelected. Former Clinton aide Lanny Davis says the Obama White House threatened his newspaper. Davis says his editor “received a phone call from a senior Obama WH official who didn’t like some of my columns, even though I’m a supporter of Obama. I couldn’t imagine why this call was made.” Don’t know what the big deal is, this kind of thing happened all the time during the Nixon years. Eric Holder: The looming budget sequestration will make Americans less safe. You know what else makes Americans less safe? Weapons in the hands of narco terrorists. But that certainly didn’t stop AG Murder from putting them there. As Left ramps up campaign to discredit him, others proudly #StandWithWoodward: We hope the man is ready for all the character assassinations. Of course if that doesn’t work the administration can always pretend he is a friend of al Queda and pursue the other sort. EXCLUSIVE: McConnell on Sequestration: No Last-Minute Deal. Based on the Senate approvals of Hagel and Lew, we have to wonder if Mitch has figured out how to get out from under Obama’s desk in the Oval Office. ‘If more men were gay there would be no wars’: Morrissey claims fighting is a heterosexual ‘hobby.’ Now we have gay’s stereotyping gays. Go figure. Man follows Biden’s advice, gets arrested. A week ago, Joe Biden recommended firing a shotgun to scare off intruders. Four days later, a Virginia man fired his shotgun to scare off armed intruders and was arrested for “reckless handling of a firearm.” Moral of this story (like so many stories): Joe Biden is a dumbass. Donna Brazille tweets: Why did my health care premiums go up? Like you said, Tweety, #healthcareworks… but what they forgot to mention was #nofreelunch.